When I was born, I didn't have your typical birth announcement. Rather, my dad created an announcement that was made to look like a playbill, that read, "A Midsummer's Night Scream," starring, "my name" and produced by "my parents." It had the doctor and nurse's names as directors and my weight and height, etc. too. So needless to say my birthday is on a Midsummer's Night and each year my mom would cook whatever dish I wanted to eat for dinner. This recipe is a Sweet Pea Mom original and what I have requested in the past for my birthday dinner. Yes, even as a child, I loved this recipe. 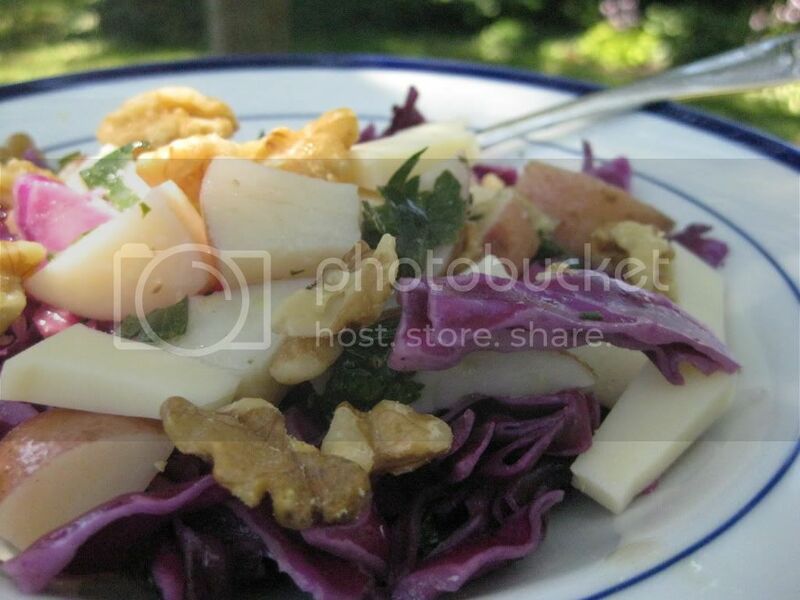 Don't let the red cabbage component of this compound salad throw you for a loop. Man, it is good, probably the best part of the salad. We make this recipe every couple of weeks with our own family and even the boys like it, albeit they are still working on "developing a taste" for the red cabbage. Boil the potatoes until al dente, about 5-6 minutes. Drain and place in a bowl. Add the turkey and cheese. Place the shredded red cabbage in a separate bowl. In a separate bowl, mix the wine through the parsley to make the dressing, pour 1/2 the dressing over the potato mixture and 1/2 over the red cabbage. Toss both bowls well. To plate, place a bit of red cabbage on the plate, top with the potatoes and then the walnuts. This looks amazing. Amazing, amazing, amazing.